WAIST HIGH: John Reed's House Of Fun To Be Released October 31. John Reed's House Of Fun To Be Released October 31. Paul Weller: My Ever Changing Moods, has written a 500+ page book about Madness which according to friend of the Waist High program Marco on the Bass is, "destined to be the new bible for all fans of the Nutty Boys." House of Fun: The Story of Madness is being published by Omnibus Press and can be pre-ordered here. Madness are a British institution. Formed at the height of Punk London in 1976, the Nutty Boys mixed old Ska and Reggae rhythms, astute social comment and music hall humour to make them the most successful UK singles band of the Eighties - as popular with the grannies as with post-punk teenagers hungry for an alternative to the glossy pop of the age. In Thatcher's Britain, Madness seemed like an anachronism: resolutely working class, down-to-earth and facing adversity with a glint in the eye. And yet, in terms of pop music, they helped define the age via hits like "My Girl," "One Step Beyond," "House of Fun," and "Baggy Trousers." From their roots in North London through their emergence as part of 2-Tone and onto their fall in the late 80s and subsequent rise via the Madstock festivals, House of Fun celebrates this very English musical phenomenon. 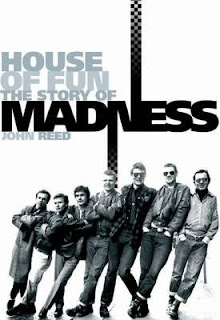 John Reed offers an affectionate yet insightful version of events, helped by candid interviews with those who've worked with Madness over the years. From the trials and tribulations of inter-band disputes, accusations of racism and their eventful split to the highs of their purple patch from 1979 to 1986 when they justified their nickname of The Magnificent Seven via an unmatched succession of classic hit singles, House of Fun - for the first time - tells the story of Madness.